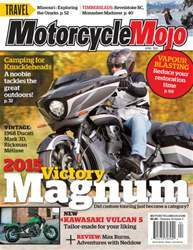 In our April 2015 issue, Costa Mouzouris attends the Kawasaki Vulcan S press launch to put this new style of cruiser to the test. Powered by a 650 cc parallel-twin engine, this cruiser has a unique feature – Ergo-Fit – that allows 18 different seating possibilities. 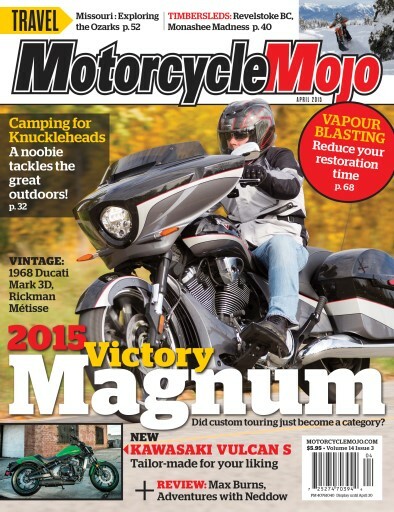 Also in our April issue is a 2000 km test ride on a 2015 Victory Magnum. Victory calls the new Magnum a custom bagger, and we wonder, did Victory just create a new Custom Touring category? David Williams, who has never been camping before, lets us in on a few of the secrets of moto-camping in British Columbia. This long Canadian winter has us pining for two wheels so we try out the next best thing – snow biking. Replacing wheels with a track and a ski, we take to the mountains around Revelstoke, B.C. A travel article from Branson, Missouri and two vintage articles round out this issue’s features. All this and so much more.